Last night, London’s premier night spot, Mahiki, celebrated its latest door policy. From now on, no one can step through its Tiki-inspired entrance wearing fur. This new sartorial legislation is thought to be the first ruling of its kind in the city. The nightclub is famous for its celebrity and royal fan base, and we wonder what the likes of Rihanna and Rita Ora will make of the decision — both are committed wearers of fur. But, club creative director Michael Evans explains that when it came to doing his part against animal cruelty, he felt there was no choice. “I was just so shocked and appalled by how horribly animals suffer, for what amounts to nothing really,” he says. “Since we have been around for eight years and have a huge celeb following, I thought it was the natural thing to do, to put the ban in place. I believe some people don't really understand. So, teaching them and creating awareness around the issue is what we are trying to do." 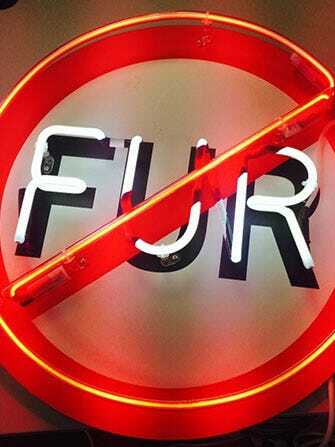 Last night, a large neon sign was erected on the outside of the door featuring the word “fur” with a large slash straight through it. And, It Girl and jewellery designer Meg Matthews, the host of the evening’s celebrations, was on hand to make sure no fur made it through to the door. PETA has unsurprisingly given this initiative its full seal of approval. Mimi Bekhechi, the foundation's associate director, says: “In 2014, everyone knows that wearing the fur of tortured animals is a serious fashion faux pas, so anyone still clinging to those ugly furs better be ready to be left out in the cold." We couldn’t agree more. With faux fur coats and accessories dominating the high street, there really is no excuse to wear anything but. Our advice for anyone hoping for access to Mahiki's hallowed halls? You've gotta fake it to make it.